Hewlett-Packard has been on a roll in the consumer PC market lately, with a new emphasis on attractive designs and a new willingness to take risks. It has competed hard with Dell on price, while at the same time offering some of the style and cool features usually associated with Apple or Sony. About 18 months ago, the giant PC maker brought out an unusual desktop computer called the TouchSmart, a bulky model meant for kitchen counters. It was intended as a walk-up home kiosk, with large icons you could activate by merely touching them to check the weather or to consult your calendar. This TouchSmart was praised for its originality, but it wasn’t as practical as promised, and wasn’t a big hit. Still, H-P is persevering with the concept. It has refined the hardware and the touch-controlled software, and has come up with a new line set to go on sale by mid-July. This new TouchSmart, which comes in two models priced at $1,299 and $1,499, is a relatively slim, one-piece desktop with a large 22-inch screen. It resembles the Apple iMac or the Dell XPS One and, like the latter, runs Microsoft’s Windows Vista. It has a wireless keyboard and mouse, and can be used as a normal Vista computer. But, like the first TouchSmart, this new model comes with H-P’s touch-controlled user interface and special programs designed to be manipulated with your fingers. For this model, H-P is de-emphasizing the idea that the machine is meant for the kitchen, but it is forging ahead strongly with the notion that touch control is the wave of the future. After testing the new TouchSmart PC for a few days, my verdict is mixed. The TouchSmart software is indeed improved. It’s attractive, more versatile and more practical — and fun to use. The hardware is handsome and well-equipped. And H-P deserves credit for continuing to build software expertise in a world where makers of computers and cellphones must become as expert at software as they are at hardware. But the latest effort has some problems. The TouchSmart interface is inviting. There’s a top row with huge icons, called tiles, displaying your favorite programs, and a bottom row of smaller tiles for other programs. You can scroll each row with a finger and decide which programs go in which row. You can even include in either row not only TouchSmart programs, but the regular Windows programs or Web sites that you like. When you tap on a tile that isn’t for a special TouchSmart program, the computer pops you into the regular Windows interface. To return to the TouchSmart interface, you just tap a home button below the screen. The TouchSmart software includes a calendar, a weather widget, a clock, music and video players, a program for composing short notes, and even a basic Web browser. All worked OK in my tests, but they’re simple and limited. The computer itself is fairly powerful. Both models have dual-core processors, large hard disks, and a whopping 4 gigabytes of memory. And both run the special 64-bit version of Vista, which allows more memory usage and can be much faster than regular Vista, but only if you buy special 64-bit software programs. This machine is loaded with every conceivable port and connector, mostly hidden from view, and the high-end model even has a TV tuner. But this is still a Vista computer, with all of the disadvantages that entails, especially a sluggish start-up and an annoying barrage of pop-up warnings. And the new TouchSmart is preloaded with craplets, those irritating trial programs and come-ons that you didn’t order. There’s a built-in Webcam that works in low light, but it’s almost impossible to tilt the computer forward to get the best shot. 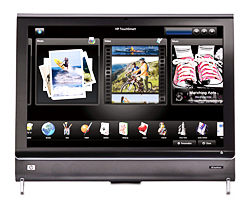 Plus, the TouchSmart software interface is very basic and is ragged around the edges. It isn’t a multitouch interface — like the ones on the Apple iPhone and in the next version of Windows, code-named Windows 7, that recognize a variety of gestures and perform different tasks when multiple fingers are used rather than just one. For example, you can’t rotate a photo on the TouchSmart by grabbing it with your fingers, or move back and forth through Web pages by swiping the browser with your fingers. The TouchSmart software is just a thin shell plopped on top of Vista, and it crashed on me four times during the course of a few days of testing. Also, the limitations of the TouchSmart applications can be frustrating. The photo application wouldn’t let me create albums. The music application didn’t display artist names for some of my MP3 files, and the calendar application can’t display an onscreen reminder of an event if you’re working in the main Vista interface. If you’re intrigued by the idea of a quick and simple interface on a handsome one-piece Vista machine, the TouchSmart might make sense. But it doesn’t deliver on the full promise of touch computing.